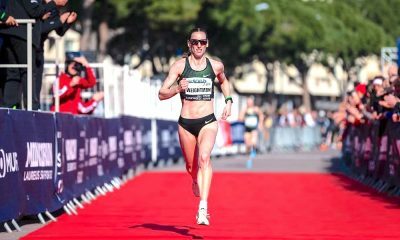 Star duo claim the top honours in the Newcastle to South Shields race, while Emma Mitchell and Hayley Carruthers deliver breakthrough performances. British record holder Mo Farah won a record fifth consecutive title at the Great North Run on Sunday (September 9). 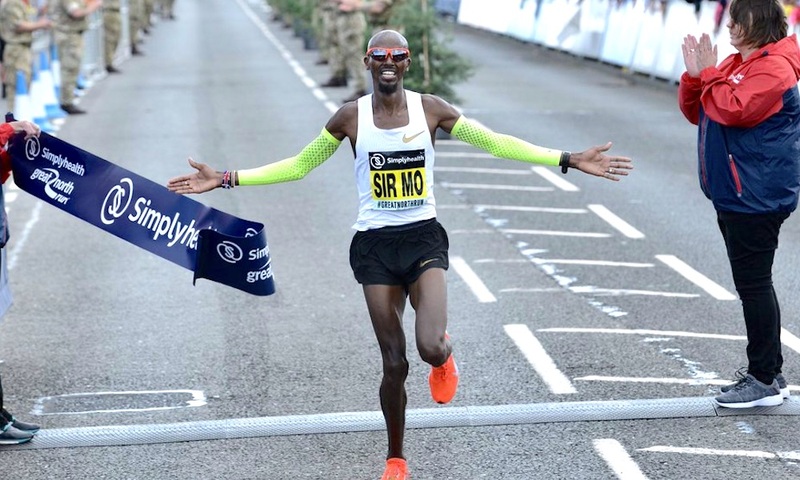 Farah clocked a time of 59:26 over the 13.1 mile point-to-point course to take the men’s honours, while Vivian Cheruiyot from Kenya won her second women’s title in 67:43. It was a repeat of last year with Farah getting the better of New Zealand’s Jake Robertson, who finished 31 seconds back in second. After an electric first mile of 4:22 the numbers in the lead group dwindled to four with Farah at the head of the pack making all the moves as Robertson, Daniel Wanjiru and Bashir Abdi hung on. Farah’s running was a little erratic, possibly tactical too, with the British star continuously looking around at his competitors. At times Robertson and Wanjiru, the 2017 London Marathon Champion, looked more comfortable than Farah, but never in control. Neither have the out and out speed of the multiple track Olympic medallist, and Farah knew this all too well. Wanjiru, then Abdi, fell foul of the fast pace, with Robertson doing his best to hold on. However, Farah always had an extra gear and stormed to a triumphant win in the closing stages. The 35 year-old, whose winning time was just four seconds off his 59:22 personal best from the 2015 Great North Run, looks in excellent form ahead of the Chicago Marathon in October. Robertson took second in 59:57, his first time running under 60 minutes, while Belgium’s Abdi claimed third place in 60:43. Thames Valley’s Mohammud Aadan clocked 63:59 to finish as the second British athlete and seventh overall. Andy Vernon was 11th overall and third GB runner in 65:04. Cheruiyot won the women’s Great North Run after a slow start allowed for a fast middle section. 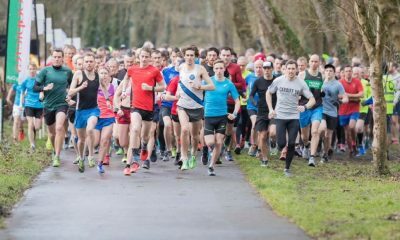 The first 10km was covered in a relatively slow 33:03, but consecutive sub five-minute miles in the second half broke the field. The 2018 London marathon champion was alone with just Brigid Kosgei in the final stages and didn’t break free until the final kilometre. As many would expect the 2016 Rio Olympic 5000m gold medallist had too much speed in the final sprint. 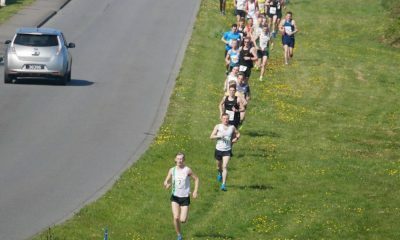 A one second PB of 67:43 was enough for the win on the day. 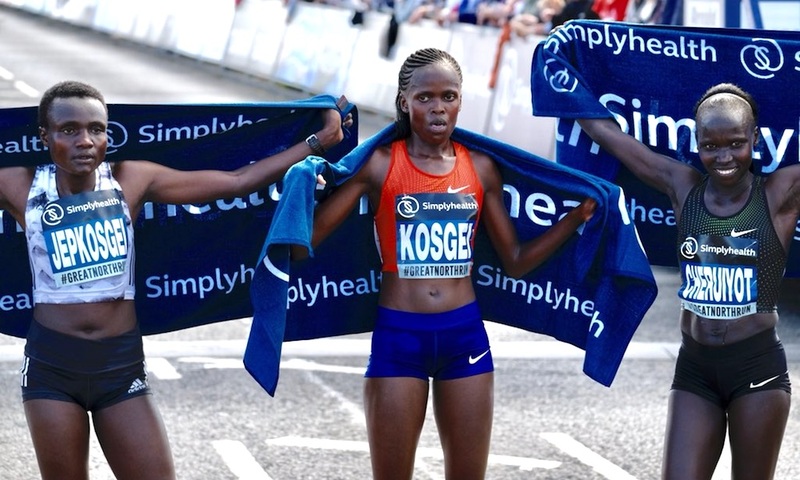 Kosgei finished second in 67:52, ahead of half marathon world record holder Joyciline Jepkosgei in 68:10. Emma Mitchell ran an excellent 74:37 on her debut half marathon. The Northern Irish born athlete, who competed for Ireland over 10,000m at the European Championships, was the first woman from the UK to cross the line in a superb eighth place. Mitchell, who holds multiple Northern Irish records including 5000m, 10,000m and 10k on the roads, looks to have her eye on the marathon in the future, with Toyko 2020 a big possibility. Hayley Carruthers, who has featured on Fast Running throughout this year, enjoyed a breakthrough run as the next UK athlete finishing ahead of established long-distance runners Lily Partridge, Aly Dixon and Charlotte Purdue. The newcomer to competitive running clocked a superb 74:46 to slice minutes off her PB. 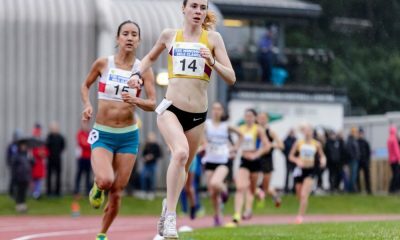 Carruthers will make her England debut next month at the Toronto Waterfront Marathon. Dixon and Partridge were not far behind in 10th and 11th in times of 75:16 and 75:42 respectively. Charlotte Purdue finished 14th in 76:50, but fell to the ground after the finish.